So, I am back in my home of Charleston now. I made the long flight from Tokyo to Dallas, where I had to wait for a few hours before making the final flight of my trip. On the plane, I sat next to man named Ric who is from Summerville. We talked about Charleston. He told me about his son, who is a teacher in Nepal. I told him about Searching for Stella and about some of my adventures. I thought about all of the people I met in Scotland, in my travels through mainland Europe, and finally in Japan. I thought about the people I wrote about and even some I hadn’t mentioned. I met so many people along the way, on trains and buses and planes, and experienced some great conversations. Toru helped me catch the faster train to Nara. 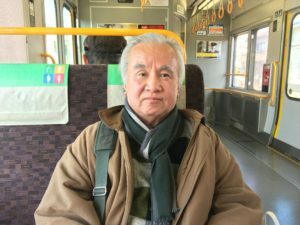 There was Toru, who helped me navigate the JR trains between Koyasan and Nara. Toru was from Osaka, and he was visiting a friend of his who lived in the countryside. He told me that he crafted the pots used in the Japanese tea ceremonies and he was also practiced karate. He even spent some time living in Spain where he helped train policemen in self-defense techniques. He was carrying a bag of fruits that his friend had grown and gave me a wonderful orange that I enjoyed very much when I reached Nara. 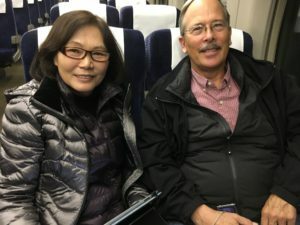 There was Shae and Jim from Ohio that I met on the bullet train that I took from Kyoto to the Izu peninsula. They had been living in Hawaii for a few months due to Jim’s job. Visiting Japan was on Shae’s bucket list, and so they had flown over for a short vacation. When I told them about the blog, Shae quickly pulled it up on her iPad and started reading it. Jim and Shae were heading back to Tokyo to finish their vacation in Japan. Pam was the flight attendant from Texas who spent a little time talking with me as I stretched my legs. She had planned on becoming an elementary school teacher but wanted to do the stewardess bit for a couple of years before she became a teacher. She loved working as a flight attendant so much that she made a thirty year career of it. She told me about her daughter. who was just beginning her career as a pediatric nurse in an ER in Arkansas. On all of those occasions, I had more of an opportunity to interact with people and get to know their stories. But there were a lot of people with whom I interacted only briefly and never got their names. There were people that I never communicated with at all. I just observed them. And what I saw repeatedly, no matter where I was, were examples of kindness. No matter what the culture or language or ethnicity, I tended to find people just living their daily lives and acknowledging one another in small moments–giving up their seat on a train or bus to someone who was elderly or had a small child, allowing someone to pass through a doorway first, sharing a smile or a nod as if to say we’re all just sharing this space on the planet right now. My mother was the type of person who looked for the best in people and shared the best of herself. She never met a stranger, not because she was the best conversationalist but because she tended to accept people as they were. I always thought that her sense of kindness and compassion was exceptional. But I think Mom would have responded with a laugh and said, “Oh, Luke.” And then she would have said that being humane is not exceptional. It’s actually the most common occurrence on the planet. Everyday in every place people are being good to one another. We just don’t talk about it as much as we talk about the darker moments. When Ric asked me if I had found Stella, I told him that I had found a little bit of peace within myself, that I had chosen to search for the best in people and had, for the most part, seen it everywhere I went. I also told him that I got to share Katie’s story with a lot of people and, while that would never bring her back, it had kept the memory of her sense of adventure alive. As I take the next couple of weeks to reflect on my travels and to decide what I’m going to do next in my life, I know that I will continue to discover my mother’s kindness and Katie’s lively spirit wherever I go because they are within me and because I choose to see them. Did I find Stella? Of course I did. I never really lost her. I like huntin, fishin, and driving around in my truck drunk. Don’t know nothing bout no fancy Ja-Pan. Beautiful story. I have enjoyed reading your posts so much. Glad you made it home safely! Thanks again for taking us with you on your trip to ‘find Stella.’ I really enjoy reading your thoughts as you traveled. And, of course, you never lost Stella, she was with you all the time, and will always be by your side. Welcome home Luther! I hope you continue sharing your adventures and stories!